NEWS – If you like to change your Apple Watch band to match your outfit or to better suit your activities for the day, you probably don’t keep your extra bands hidden away in a jewelry box or drawer. 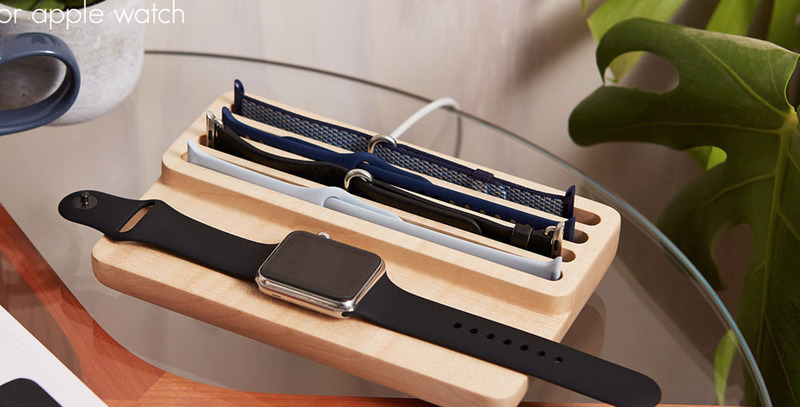 If you’d like to keep a few of your favorite bands close at hand for quick changes as you get ready for your day, you’ll be interested in the Valet for Apple Watch from Anden. The Valet is a flat piece made of wood or Corian. 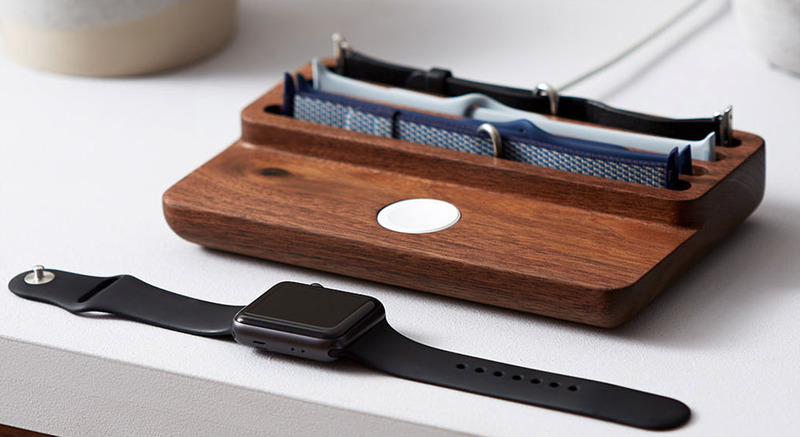 The front holds the Watch charging puck, and you’ll need to supply your own. The charging station works with all current versions of the Apple Watch, including the new Series 4. The back of the Valet has four grooves to hold spare bands. Anden says they’ve yet to find an official Watch band that won’t fit in the Valet’s grooves. They don’t mention or show a Watch with a loop band, such as the Milanese metal mesh band, charging on the Valet. I’d think you’d have to remove the loop band to be able to charge the Watch, as it must lay flat on the Valet. Anden uses sustainable sources for all their wood; it’s often rescued from larger cabinetry commissions. Available materials are: solid maple, walnut, cherry wood, and a limited-edition pure white Glacier Corian (the same, high quality, exceptionally strong material they make designer kitchen worktops from). Anden says that each piece is made when ordered, so it might be possible to accommodate you if you request a particular wood or color of Corian. The Valet is made in England, but they can ship worldwide. The Valet in the offered woods is $119 US dollars; the Corian is $171 US. Order at the Anden website. I loved the idea of this until I saw that the charger requires the watch to lay flat. I had another charger that required the watch to lay flat and it NEVER worked. I can’t vouch for all bands, but even the sport bands have enough spring in them that they prevent the watch from laying completely flat without something putting downward pressure on it. I’d lay the watch on the charger and it would lift up slightly due to the spring action of the sport band. It would never charge the watch. I’ve got the Valet and have had no issue with it charging when lying flat. The magnet in the charger has more than enough strength to pull it down. Some of the chunky bands (and loop) might struggle to fit but I’ve got four official straps and they all fit fine.